Both of these dishes are from Veganomicon. 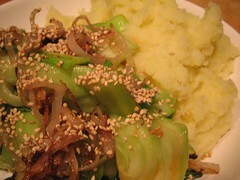 They aren’t presented as one meal; they’re in the mix and match section, but in the preamble to the pak choi recipe, Isa suggests serving it with wasabi mash. It was an interesting idea but I felt that the pak choi lacked a bit of flavour served this way. Nest time I would definitely add some chilli or chilli sauce in with the pak choi as I cook it. If you can only get those little packs of pak choi from the supermarket I wouldn’t bother; I got a huge bag from the Asian shop near me.